Google co-founder Larry Page is taking over as CEO in an unexpected shake-up that upstaged the internet search leader’s fourth-quarter earnings. Page, 37, is reclaiming the top job from Eric Schmidt, who had been brought in as CEO a decade ago because Google’s investors believed the company needed a more mature leader. 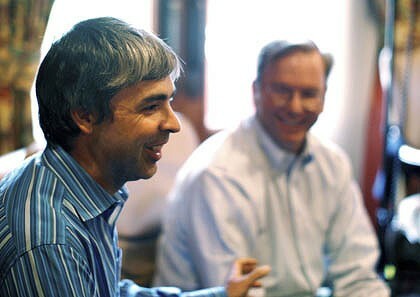 Schmidt, 55, will remain an adviser to Page and Google’s other co-founder, Sergey Brin, as Google’s executive chairman. The changes will be effective April 4. “In my clear opinion, Larry is ready to lead and I’m excited about working with both him and Sergey for a long time to come,” Schmidt said. Page praised Schmidt, too. “There is no other CEO in the world that could have kept such headstrong founders so deeply involved and still run the business so brilliantly,” Page said. The change in command overshadowed Google’s fourth-quarter earnings, which soared past analysts’ estimates as the company cranked up its internet marketing machine during the holiday shopping season. Net income rose 29 per cent to $US2.54 billion, or $US7.81 a share, from $US1.97 billion, or $US6.13, a year earlier, Google said on its website. Profit excluding some items was $US8.75 a share, exceeding the $US8.08 average of estimates compiled by Bloomberg. Google benefited from its core search-engine business as advertisers stepped up efforts to reach consumers through the internet. Spending on search-based ads rose 23 per cent in the US during the quarter, with gains in retail and travel, according to Efficient Frontier, which manages more than $US1 billion annually in online advertising. Sales, excluding revenue passed on to partner sites, were $US6.37 billion, topping the $US6.06 billion average of estimates. Android topped Apple’s iPhone in US smartphone subscribers for the first time in November, accounting for 26 per cent of the market, compared with 25 per cent for Apple, according to ComScore BlackBerry maker Research In Motion had the top spot with 33.5 per cent. While Google doesn’t charge for Android, it’s helping the company expand mobile-advertising sales. Google was projected to grab 59 per cent of the US mobile-ad market last year, according to research firm IDC. Google benefitted from its May 2010 acquisition of AdMob, which had 8.4 per cent of the market in 2009. In October the company said it expects to exceed $US1 billion in annual mobile-ad sales and $US2.5 billion in display-ad revenue. The company noted there could be overlap between the businesses’ sales. Google is maintaining its leadership in the search-engine business even as it faces a stronger challenge from rivals Yahoo! and Microsoft. In August, Yahoo! began using Microsoft’s Bing technology to provide online search results. Google grabbed 66.6 per cent of searches in the US in December, up from 66.2 per cent in the previous month. Combined, Microsoft and Yahoo had 28 per cent, down from 28.2 per cent, according to ComScore.